A new and very definite addition to my collection of eye makeup removers: the Camomile Waterproof Eye & Lip Makeup Remover from The Body Shop. Really efficient – it actually does dissolve waterproof makeup, though you have to press the cotton wool over your eyes for a while. This is a good old bi-phase or dual-phase remover that has an oily layer with a watery layer – mix the two together and hey-presto, makeup removing magic. This will sit alongside Lancome’s Bi-Facil (a cult product in my books) and Clinique’s Take The Day Off. 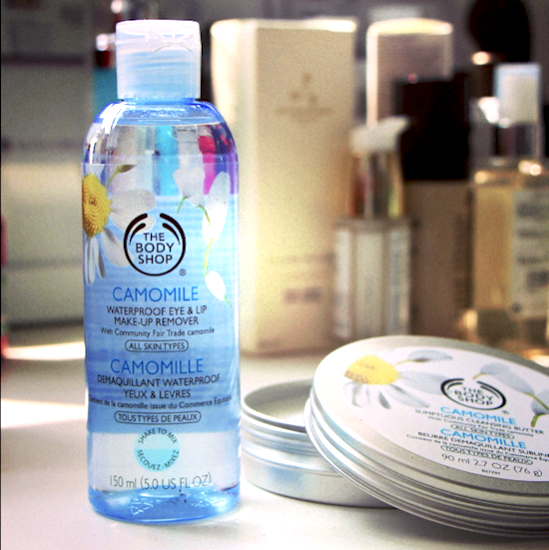 You can find the Camomile remover at The Body Shop here. It has only just launched and costs £8.